Did you know there are twelve different bands with Abhorrent in the name on Encyclopedia Metallum? It would explain why I was sure I’d heard of this band before, and then turned out to be mistaken. I was thinking of Abhorrent Decimation, as it turned out… Anyway, Abhorrent Deformity’s new record, ‘Entity of Malevolence’, finds these North Carolinians on top, devastating form. 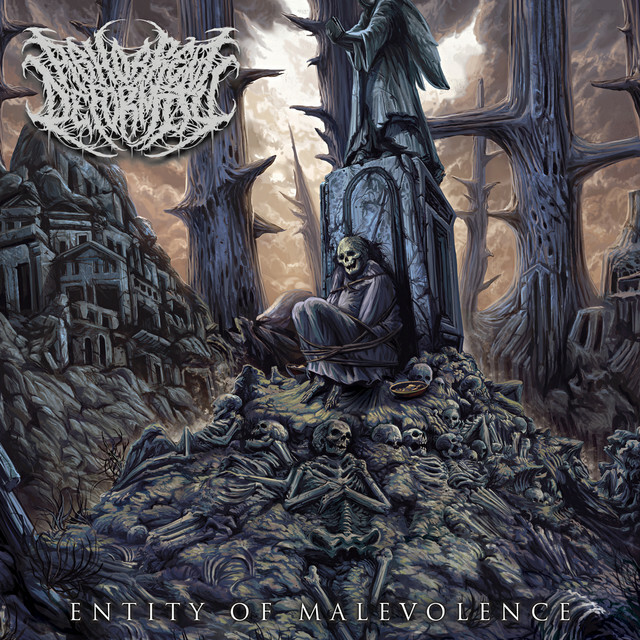 ‘Entity of Malevolence’ offers sacrifices at the diseased altar of mighty brutal death gods like Devourment or Dying Fetus. While not going completely incomprehensibly brutal, Abhorrent Deformity’s brand of death metal is definitely brutal to the max. Blastbeats pepper the landscape of grinding riffs, while inhuman grunts and growls are uttered from a dark, dark place. ‘Skeleton Carver’ is a particularly good example of everything the band do right, as is the punishing ‘Buried Beneath Human Remains’. But it’s the whole album experience that is most satisfying about Abhorrent Deformity’s debut. Each song is well written, with copious amounts of brutality and ace riffs. The songs don’t outstay their welcome, and most lead to almost constant headbanging. Whether or not the band get lost in the mix of bands that do this kind of music at the moment is anyone’s guess, but ‘Entity of Malevolence’ is a raging statement of crushing intent that Abhorrent Deformity need to be respected for the sheer heaviness of what they do. BROOTAL!